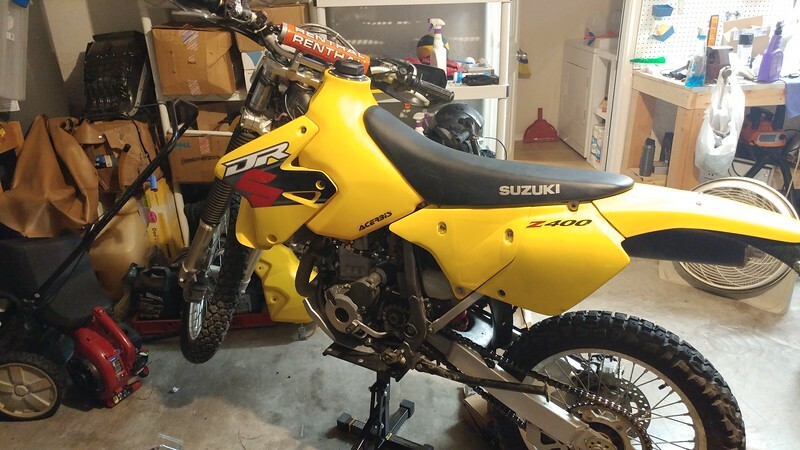 LeanAngle: Acerbis tank installed on the DRZ. Today consisted of doing a little more inventory and getting the Acerbis tank installed and plumbed. The purpose of the Acerbis tank is that it's larger than stock. The stock tank is 2.6 gallons while the Acerbis can hold 3.7 gallons thus extending the range of the bike by about 50% compared to stock. It equates to about another 40-50 miles depending on mpg at the time. Here's a look at the install of the old tank. Seems to be 1/4" line which is smaller than stock 5/16" fuel line but looking online many haven't had an issue with it. 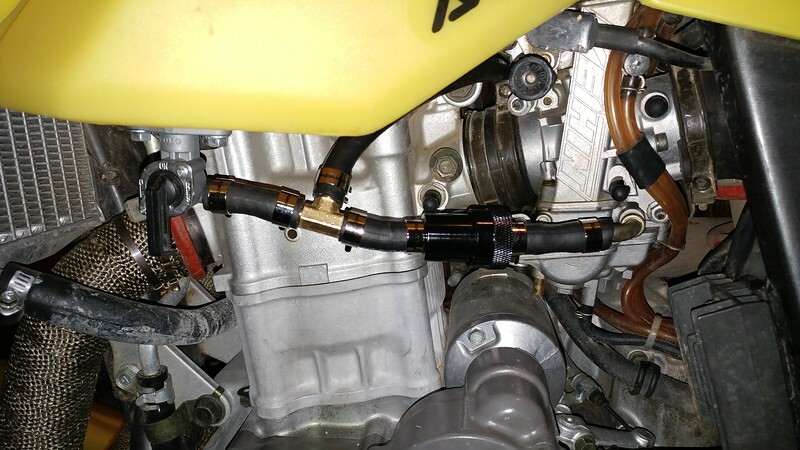 Still, if I'm going to re-plumb it, I'll do it with the right size fuel line. 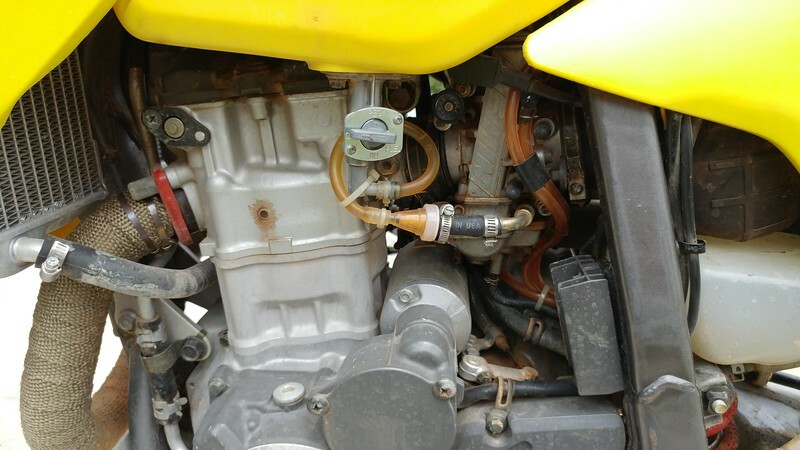 The Acerbis fuel tank presents an issue in that it has petcocks on the downward portion of the tank on both sides of the frames. This is nice because you don't get any fuel trapped on the right side of the bike requiring you to go through the procedure to access the "Secret reserve" by laying the bike on it's side. You can leave one petcock off and you have a reserve should you need it. It does present a plumbing challenge though, because you'll need to run two lines and a T pipe to bring them together. I also needed a new fuel filter and 5/16" filters were a bit of a challenge to find, hence why the previous owner likely went with the 1/4" line and filter. I grabbed up a reusable filter from Emgo anodized black for a decent price, but it's a little on the large size. Still, careful cutting of line got it all in there and working. There's a slight bend in the system due to having a smidge too much fuel line and having a hard time getting the line on the connectors, but it'll work. Nice shiny clamps that'll get dinged up in no time finish it out. They were cheap so I went with them. I'm not worried about the lines coming off anyway, as hard as they were to get on. Mostly buttoned up and test started, all is working well. I also did a chain/sprocket inventory so I can fiddle with gearing to get it where I want it. Looks like stock gearing is on there right now.